CSS stands for Custom Sports Special. CSS is a trim package and could be ordered on D&W 100, 200, Sweptline, Utiline, and Chassis cabs type trucks. The CSS package was offer from 1964 thru 1966 but examples of 1967 CSS's were produced.The package consists of various parts pulled from other vehicles. The CSS option was around $235. if you have Dodge ads or brochures that show the CSS package being offered in 1967 i would be interested in acquiring a copy - see contact info below. What is a HPP truck? HPP stands for High Performance Package. The HP Package could only be ordered on D100 and D200 long bed trucks. 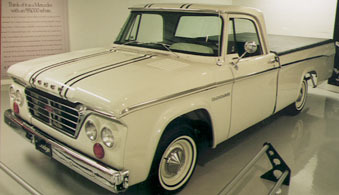 .The package was officially offered from 1964 thru 1965 HOWEVER verified examples of a 1963 and a 1966 truck have been produced. 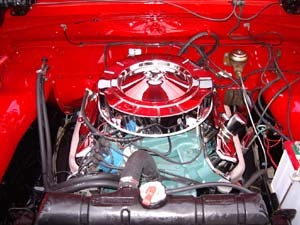 The HP package was again pieced together from other Dodge assembly lines to create the package. This Package was retailed for over $1200. How Many are Known to Exists? A CSS trim equipped truck with the 426 Wedge is a combination of the two packages described above. I classify the 426 powered CSS machines as CSS/HPP equipped trucks. Verified examples in the registry of HPP equipped trucks are all LWB in D100's and D200. Currently the CSS/HPP Registry has the full range of trucks in the database. Visit the registry page for a spreadsheet listing all trucks in registry. Please note: not all trucks listed above appear in the online "public" side of registry per the owners request. A Data plates is mounted on the Driver's side door pillar and contains all certified information pertaining to that truck including GVW, spring capacities, axle ratio, wheel base, net horse power, etc. A 426 powered truck would be stamped "SPECIAL" in most boxes. 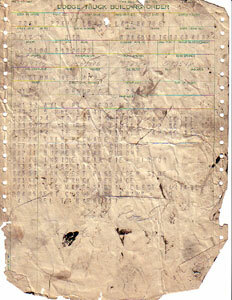 This Data plate example is from my 1964 HPP only truck. What is a SERT Sticker? Any non-standard part would be listed on the SERT sticker. SERT stands for Special Equipment Release Truck. All part-group part numbers of the non-standard options are listed on the SERT sticker along with the SERT summary (The SERT summary is a part number that summarizes what is in the group). Each SERT number corresponds to a SERT sheet, which the production line would use to add the part to the truck either on the line or in the 9190 repair department at the end of the line. In the case of a CSS/HPP truck it would list two summaries - the CSS trim package and the High Performance package. The SERT sticker shown here is from my non-CSS HPP 426 machine. Please Note: the CSS trim package can ONLY be verified by a SERT sticker or Build sheet. What is a SERT Sheet? The SERT sheet is a series of sheets that help the assembly line build and produce a dodge truck with non-standard options. While similar to a Build Sheet the SERT sheet is different in that it lists every nut, bolt, washer, bracket, part, and hose that will be used in the addition of the special ordered part. This example is the summary for the 426-wedge engine option and there are over 11 pages that make up the total SERT sheets for that group. What is a Build Sheet? The Build Sheet or forecast sheet is what the factory uses to construct the truck. It has the born-on date and the order in which it was to be built. 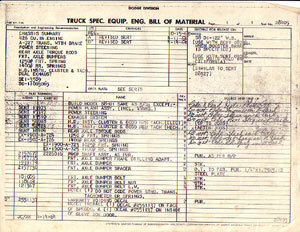 It also includes a list of standard parts and what options will be included on that truck. This example is from my 1964 D100 426 truck and was found in the seat springs next to another handwritten build sheet with SERT numbers listed for that truck. How Easy is it to Verify a CSS and or HPP truck? Data plates and/or SERT stickers easily verify all examples. Each example can be cross-referenced to each other for part group numbers and SERT summaries. For more info on SERT summaries and part numbers please contact the CSS registrar - Ben Simons. How Do I Register my CSS or HPP Truck? email me for my phone number. Please Note: Trucks without photo verification and VIN's are not included in the registry. Your VIN and other personal information is kept private and will not be published - this includes SERT numbers for all trucks.